Town of Bavaria, in the province of Swabia, on the Danube. A small but flourishing Jewish community existed there in the sixteenth century. In 1566 the Jews of Günzburg petitioned Emperor Maximilian H. to recognize as rabbi Isaac ha-Levi, who had officiated in that capacity for thirty years. The official recognition was sought in consequence of family quarrels between members of the community, which the rabbi was powerless to settle so long as his authority was unrecognized. 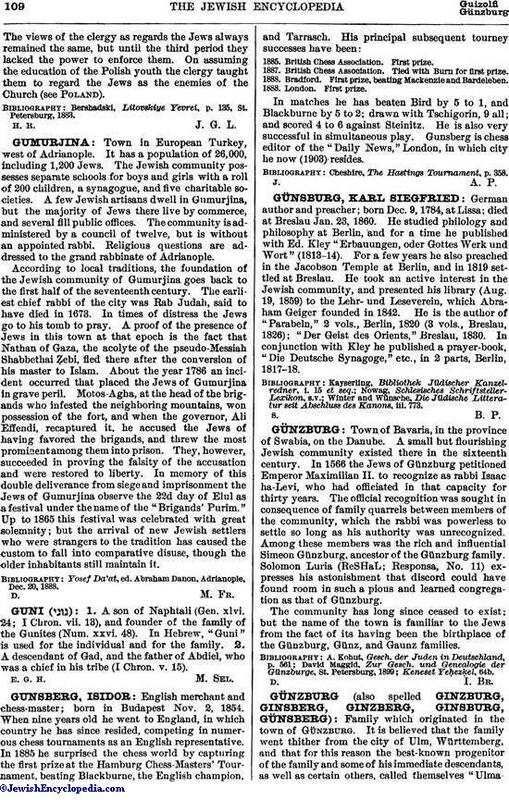 Among these members was the rich and influential Simeon Günzburg, ancestor of the Günzburg family. Solomon Luria (ReSHaL; Responsa, No. 11) expresses his astonishment that discord could have found room in such a pious and learned congregation as that of Günzburg. The community has long since ceased to exist; but the name of the town is familiar to the Jews from the fact of its having been the birthplace of the Günzburg, Günz, and Gaunz families.